Looking for a place to go fishing in Napa County? If you want to go fishing in Napa County you’ve come to the right place. Whether you’re looking to plan a family fishing trip or just want to find a place in Napa County to go fishing — I urge you to keep reading. I’ve taken the time to assemble a comprehensive list of places to fish throughout Napa County, California. The list includes lakes, ponds, rivers and streams along along with details about each location such as surface area, elevation, inflow, outflow, Geographic Names Information System (GNIS) ID and the fish species present. Pro Tip: View the California Department of Fish & Wildlife’s Trout Planting Schedule for Napa County, California. 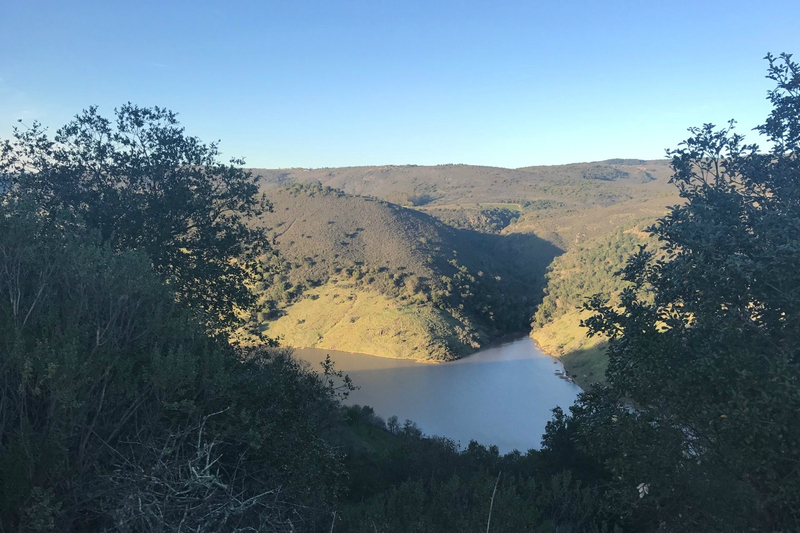 As one of Napa County’s most popular recreation destinations, Lake Berryessa is formed by damming Putah Creek at the Monticello Dam 20.8 km (13 mi) northwest of Vacaville, bound on the east by Rocky Ridge and on the west by Trout Creek Ridge and Cedar Roughs. 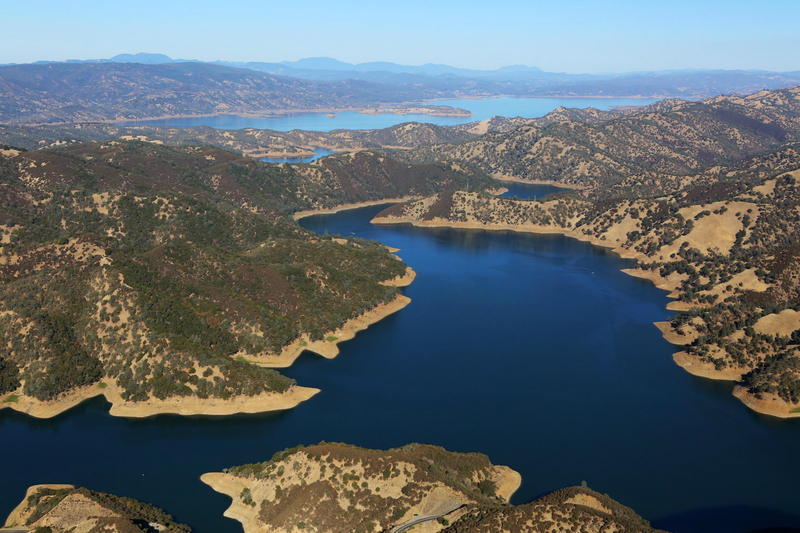 Lake Berryessa is ranked as the 6th Best Bass Fishing Lakes in the Western United States according to Bassmaster. Fish: Bluegill, Brown bullhead, Channel catfish, Common carp, Black crappie, White crappie, Largemouth bass, Smallmouth bass, Spotted bass, White catfish, Rainbow trout, Brown trout, Brook trout, Kokanee salmon, Chinook salmon and the Sacramento pikeminnow (squawfish). Often overshadowed by Lake Berryessa, Lake Hennessey is is one of the less traveled lakes in Napa County and is popular with sailing enthusiasts and anglers alike. Lake Hennessey is also known as Conn Valley Reservoir, formed by damming Conn Creek. Lake Hennessey is considered deep, having a maximum depth of just over 85 ft. (near the dam). Fish: Black bullhead, Back crappie, Bluegill, Brown trout, Central California coast winter steelhead, Central Coast coho salmon, Central Valley spring Chinook salmon, Channel catfish, Coastal rainbow trout, Coastrange sculpin, Golden shiner, Green Sunfish, Hardhead, Largemouth bass, Pacific lamprey, Redear sunfish, Riffle sculpin, Sacramento blackfish, Sacramento hitch, Sacramento pikeminnow (squawfish), Smallmouth bass, Threadfin shad, Western mosquitofish and the White catfish. Rector Reservoir is a reservoir located in Napa Valley, California, located to the northeast of Yountville and southwest of Lake Berryessa. Rector Reservoir supplies water to the city of Yountville, CA. The reservoir is part of the 340 acre Rector Reservoir Wildlife Area, which has 27 species of mammals, 40 species of birds, and 14 species of reptiles and amphibians. Fish: Black bullhead, Back crappie, Brown trout, Central California coast winter steelhead, Channel catfish, Coastal rainbow trout, Coastrange sculpin, Inland threespine stickleback, Pacific lamprey, Redear sunfish, Riffle sculpin, Sacramento blackfish, Sacramento hitch, Sacramento pikeminnow (squawfish), Sacramento sucker, Smallmouth bass, Threadfin shad, and White catfish.